‘Art Deco’ in colour ‘Melon’ from Knots Rugs. 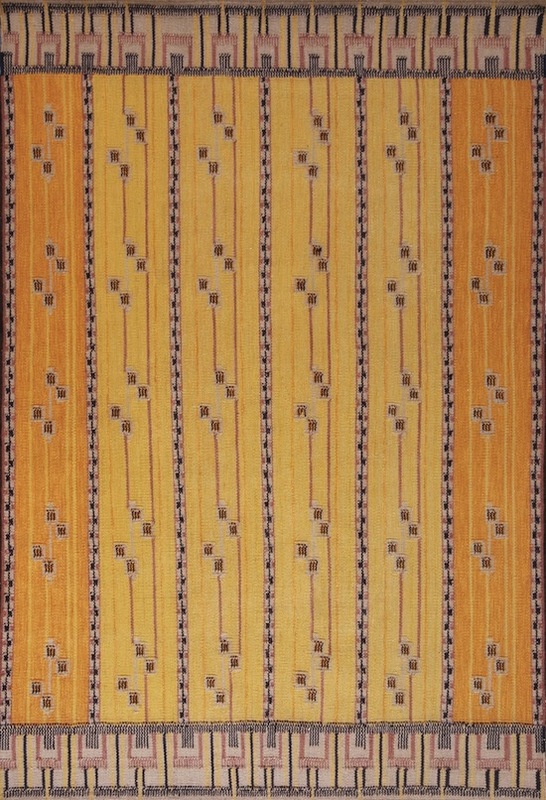 Image courtesy of Knots Rugs. But a single award winning carpet inspired by the 20th century does not a trend make. And while I am hesitant to declare it a trend – or as has now become ironically popular, an anti-trend – there were nevertheless several eye-catching designs inspired by and reminiscent of the aforementioned century presented during DOMOTEX. From France to Scandinavia to Germany to Pennsylvania to all of the places that took inspiration from each other and pushed the envelope of superior design, we present a small selection of carpets thusly inspired. 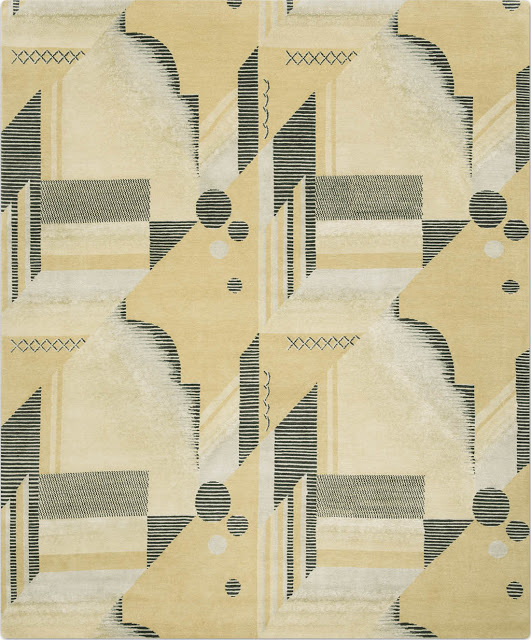 The design of the above featured modernistic ‘Art Deco’ carpet from Knots Rugs came from an original piece of Deco fabric dating from what was the heyday of the genre, the interwar period. Originating in France before being adopted globally, Deco made use of design elements ranging from traditional craft motifs to Machine Age imagery that reflected the luxury, glamour, and exuberance of the period. Characterized by rich colours, bold geometric shapes, and lavish ornamentation the style enjoyed widespread popularity, especially in the North American cities of Asheville, North Carolina and Miami Beach, Florida. The latter holding the distinction of being the first 20th century neighbourhood to be listed on the United States’ National Register of Historic Places thus signifying the importance of the aesthetic. 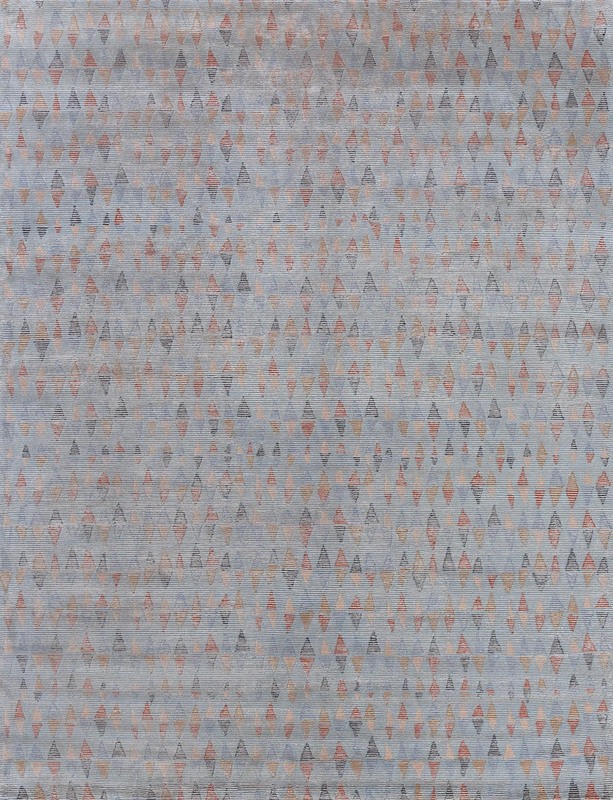 Available in three (3) standard colourways, the 1920’s era geometric design has been updated using fresh modern colours, a combination of contemporary carpet materials, and a Nepali made Tibetan knot construction that is an ode to the period. ‘C3168-X187’ from Mischioff’s Tibey Collection. Image courtesy of Mischioff. Florence Knoll was a renowned American architect and furniture designer whose eponymous company still produces some of the most iconic furniture designs of the 20th century. Having studied under Mies van der Rohe and Eliel Saarinen, and through a close personal friendship with the former, the work of Ms. Knoll is heavily influenced by the Bauhaus and the post war exuberance and wealth of the United States. 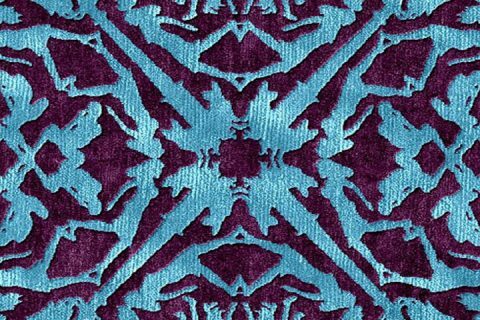 That same lively, energetic, anything is possible attitude is reflected beautifully in this carpet from Mischioff’s Tibey Collection. 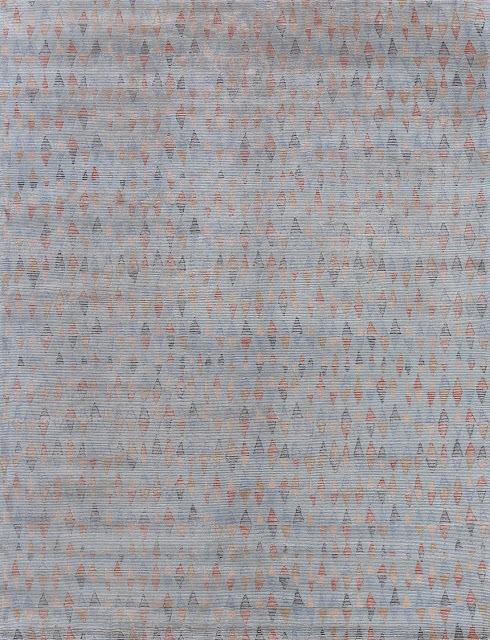 With a playful and somewhat naive design reminiscent of construction paper artwork, the carpet’s knollian sophistication lies in the juxtaposition of simple patterning against the charm of Tibey’s loop and cut pile knotting technique. Knotted in alternating rows of woollen loop-pile and silk cut-pile with design only rendered on one (1) of the two (2), the carpet has the ability to age beautifully and timelessly while providing an enduring foundation to an ever changing aesthetic. ‘Tin Pan Alley’ from Reuber Henning. Image courtesy of Reuber Henning. ‘Tin Pan Alley’ from Reuber Henning is named after the collection of music publishers and songwriters who dominated American popular music during the late 19th and early 20th centuries. Part of their Ragtime Collection which pays homage to early Jazz, ‘Tin Pan Alley’ was inspired by an old Bauhaus textile from the same period. Compared to the more literal carpet translations of Bauhaus master Gunta Stölzl’s work, this carpet delivers a distinctly playful and organic interpretation which eschews straight lines, providing a familiar comfort by way of a dominant main colour with the surprising flourishes of the unexpected through vibrant and daring accent colour selection. Interplay between classic Nepalese Tibetan knot weaving and soumak further reinforce the reference to Jazz improvisation. ‘We always love rugs that are more about understatement than the ‘bling, bling’ of the moment because they show their beauty for years and not all at once.’ according to Birgit Krah of Reuber Henning, herself a student of art at the reconstituted Bauhaus University in Weimar. 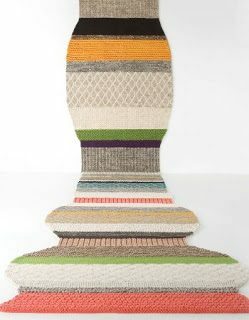 Award Winning ‘Marta Stripe’ from Rug and Kilim. Image courtesy of Rug and Kilim and DOMOTEX. ‘Marta Stripe’ from Rug and Kilim was inspired by the work of renowned mid-twentieth-century Scandinavian weaver Marta Måås-Fjetterström. While oft overlooked in the modern world of rugs, Scandinavia has a long and storied tradition of rug making dating back hundreds of years. With those from Sweden being most desirable in the current marketplace, it is only fitting the judges of this year’s Carpet Design Awards chose to honour those contributions to rug weaving, if only by proxy, by bestowing the moniker ‘Best Traditional Design’. Through its embracing use of colour and strong geometric patterns ‘Marta Stripe’ breaks not only the literal bleakness of a northern winter, but also the figurative bleakness of crisp whites, greys, and soft beiges found in contemporary interiors. In reflecting on the inspirations of the last century that brought us these carpets of today, one is left to wonder: What was going on in the world that allowed for so much creativity and an explosion of genuinely enduring design? Exuberance? Perhaps a far less oppressive copyright regime? Whatever the reason, let us endeavour to recapture that energy to drive a new decorative renaissance. 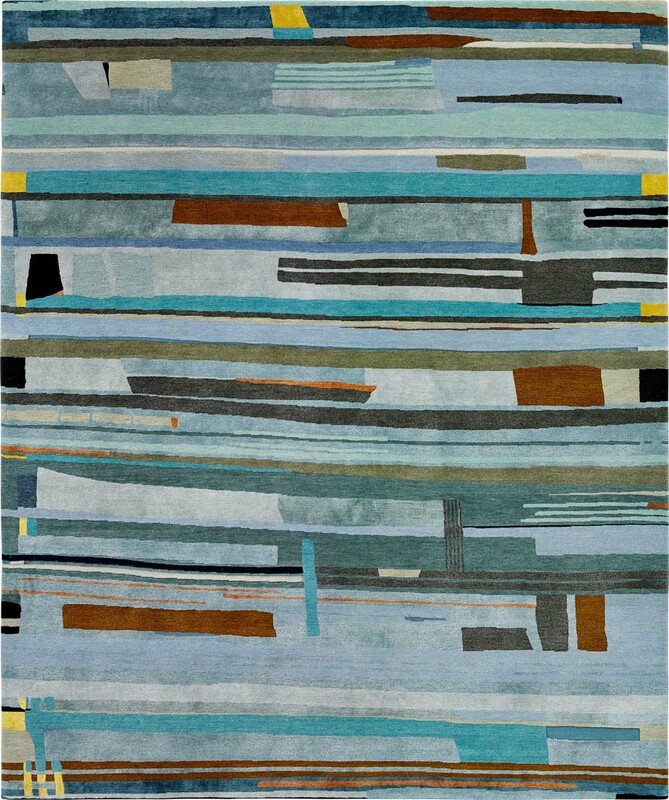 ICFF Rug Review… And more!